Horrific car accidents, the Bali bombing, too many sausages … Sean Smith survived them all. This is one man’s story of his journey back to health and fitness and recapturing his passion for life. As a hard-playing, hard-living rugby forward, Sean Smith was used to putting his body on the line. That soon changed when two severe motor-vehicle accidents left him with devastating physical injuries, unable to regain his past physical fitness or his zest for life. After witnessing firsthand the horror of the 2002 Bali bombing, Sean also found himself suffering from post-traumatic shock. Compulsively working long hours in a stressful job and battling to find time to be with his wife and two small daughters didn’t help either. A losing battle against obesity and an ongoing struggle with depression followed. After being told by doctors he was a prime candidate for a heart attack at just 36, Sean decided enough was enough. He took up kayaking (a sport that could accommodate his injuries) and then decided to tackle one of the toughest paddling competitions in the world: the 111-kilometre Hawkesbury Canoe Classic night ultra-marathon. What follows is an entertaining and inspiring account of Sean’s journey back to health and fitness. His many hours training on the waterways of Sydney, and a trip to Alaska paddling amongst icebergs and running away from bears, fuelled a new appreciation for the beauty of the outdoors and recaptured his enthusiasm for living. Sean’s story is an uplifting experience for those looking for motivation to regain their fitness and enjoy life to the full. ‘The Fat Paddler represents all the values that we respect and admire in an Aussie bloke. He gets out there and gives it a go.’ – Justin Jones and James Castrission, authors of "Crossing the Ditch", "Extreme South" and "Crossing the Ice"
This is a really enjoyable book. Sean has a great story to tell and he is instantly likable. 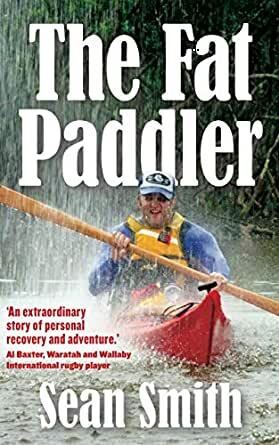 My only regret about the book is that it did not actually have as much detail about kayaking as I would have liked (my main reason for buying the book), and as a big guy myself I would have liked more in the trenches detail about how he improved his health, fitness and recovery. All that aside it is a fun fast read and would gladly recommend it. All great wisdom comes from suffering doesn't it? Sean Smith knows too much about pain - nearly losing his life in motorbike & car accidents & then being at the Bali bombings. With much self deprecating Australian humour he writes candidly about his road to recovery. The love of a wife and kids, the camaraderie of the rugby community & good mates, and a rediscovery of the outdoors bring healing. His love of paddling is contagious - whether its encounters with Beluga whales in Alaska or grinding out long miles in the Hawkesbury Canoe Classic. This isn't just a book for paddling tragics. It's not about the boat. It's a remarkably generous sharing of a life story and well written to boot. A worthy read. This story just wasn't my cup of tea. I prefer adventure that's big, like Paul Caffyn circumnavigating Australia, or someone trying to do the NorthWest Passage by kayak. There is inspiration to be found to do with physical recovery but not so much for great trips. Been waiting for this book to be available on Kindle and finally it arrived! I was very impressed with the author's writing style and thoroughly enjoyed the read - I finished it in record time which says something because I am usually a slow reader but I kept on wanting to know what was next on the horizon and so just kept on reading! Having met the author, I had no idea of the history of this inspiring episode in his life so I was quite amazed by what I read. I am looking forward to his next work!